Apert Syndrome is a rare condition that leads to physical deformities and abnormalities in mental capacity. Know all about the causes, symptoms, diagnosis and treatment for Apert Syndrome. Here are also some Apert Syndrome images that you may use for reference. What Is Apert Syndrome ? It is a rare genetic disorder in which the lines between the bones of the skull close sooner unlike in normal persons. This has a direct impact on the shape of the head as well as the face. This disease is a form of Acrocephalosyndactyly, a congenital condition marked by deformity of the face, skull, hands, and feet. It can be seen in only one of about 200,000 live babies. The condition has been named after the French physician Eugene Apert who was the first person to report about symptoms of this disease in nine people in 1906. This condition is mainly characterized by early closedown of seams between skull bones. This is marked by formation of ridges along the sutures. In babies, large soft spots may arise on the skull that close later. This disease leads to severe under-development of the middle part of the face. This condition is known as “Midface Hypoplasia”. The face has a concave appearance in this condition. The nose bridge looks pressed down. The eyes have a bulging appearance and they are set apart by a wide gap. In many sufferers, the eyes are often found to be protruding out of the sockets. The teeth are clustered together giving an unusual appearance to the face. The disease also leads to a highly arched and narrowed palate. In approximately 68 percent of children affected by this condition, some of the neck bones fuse together. This condition is known as Cervical Spinal Fusion. The disorder also leads to the fusion or webbing of the toes and the second, third and fourth fingers of the hand. In some cases, the fifth finger is also involved. The bones in the hands as well as feet of a child with this condition become progressively fused as he or she grows up. This decreases functioning as well as flexibility of the limbs. A hand that has webbed fingers like this is referred to as a “mitten hand”. A foot with webbed toes is called as “sock feet”. The fusion of toes in the feet is a condition that is known as “Syndactyly” while that of the fingers in the hand is referred to as “Synonychia”. The skull of infants comprise of an array of lose bone plates that have the capability of expanding with the passage of time. This allows the brain space to grow. As a child grows, the skull plates start coming together and fuse progressively. The plates eventually turn solid in adolescence. In Apert Syndrome, the bones of the plate fuse within a short time. The brain does not find time enough to expand. It also suffers from a lack of space in the skull to develop. This gives rise to abnormalities in the facial structure as well as developmental delays. The early fusion of the skull bones is known as “Craniosynostosis”. Genetics and some complicated conditions are held as Apert Syndrome causes. In individuals affected with Apert Syndrome genetics has been found as the main causative factor. This disorder has been found to pass down generations in the same family. The disease is supposed to be transmitted from parents to offspring as a dominant autosomal trait. It needs only one parent with the defective gene to pass the disorder into the offspring. The syndrome usually occurs due to a mutation in a gene known as Fibroblast Growth Factor Receptor 2. This mutation results in a genetic defect that leads to early closure of the bony sutures in the skull. 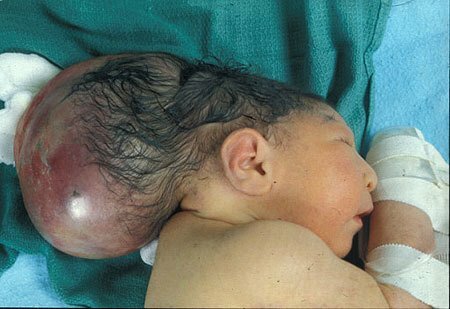 This early closure is known as Craniosynostosis. In most cases, this disorder is found to arise as a consequence of spontaneous mutations. However, a parent with this condition can also pass it on to his or her offspring as has been mentioned above. This is a congenital disease. This condition is mainly diagnosed by physically observation. Physical signs associated with this condition are evident during birth of a child. Fusion of fingers and toes are enough to tell Apert Syndrome apart from other conditions. If the doctor suspects the condition, tests such as X-rays of hands, feet or skull may be carried out to establish it properly. X-Ray can help measure the extent of defects in the bones. It can also help find out if some other bone condition is responsible for the symptoms. A genetic test may also be carried out to detect mutation of the Receptor 2 gene. In some cases, tests may also be performed to analyse the hearing capability of the sufferer. This operation aims at separating the plates of the skull to allow enough space to the brain to expand properly. This is best carried out when the sufferer is still in infancy. The purpose of this surgery is to repair the structural abnormalities of the face and give it an appearance that is more or less normal. This surgery aims at separating the fusion of the digits of the hands and the feet. When successfully performed, this surgery allows greater range of limb motion to the affected individual and also resolves problems of fused fingers and toes. The prognosis is usually very good if the surgery is performed earlier. Early interference can decrease brain and facial abnormalities and avoid physical complications. However, repeated cosmetic surgeries may be required to repair facial structure completely. Patients of this condition usually live as long as a normal person. However, some symptoms arising from this condition may invite other complicated disorders and lead to a premature death of the individual. But this happens only rarely. Want to know how patients with this condition look like? Here are some Apert Syndrome photos that you may find useful in understanding the disease. Check out these pictures of Apert Syndrome and know about the appearance of people suffering from this condition. Apert Syndrome is a rare but very abnormal condition that can alter the physical and brain structure of an affected person. Luckily, early surgery for this disease has an excellent prognosis. If you find any infant in your family exhibiting symptoms of this condition, seek immediate medical assistance for him or her. This will prevent future complications and help in early recovery thus providing the affected infant a chance to lead an active life like any normal individual.